Renovations to a key commercial building in Fields Corner are underway this month as four new tenants prepare to open up shop along Dorchester Avenue. The building, which once housed the defunct Emerald Isle bar and Yum-Yum Chinese restaurant, has undergone a “gut-rehab” in recent months. The 6,000-square-foot building carries a Faulkner Street address, but its five retail spaces face a bustling stretch of Dorchester Avenue in the heart of the business district. The building abuts the popular Blarney Stone restaurant, which has thrived in spite of the still-forlorn exterior of its next-door neighbor. A trio of new owners – Ted Ahern and brothers Brendan and Greg Feeney – purchased the building last January for an undisclosed price. The city of Boston’s Assessing office values the property at $618,500. Both Ahern and the Feeney brothers – who operate a Fields Corner-based excavation company with more than 200 employees – are experienced and respected property owners with deep roots in the neighborhood. Ahern is a native of the Bowdoin-Geneva section and lives in Dorchester. Emerald Isle block re-imagined: A rendering of the completed building.Among the new tenants set to move into the restored building over the next few months is a T-Mobile store that will anchor the corner next to Faulkner Street; a take-out only Chinese fast food eatery that will be run by new owners; and a new restaurant called Boston Burger and Chicken. An existing Fields Corner business, Valente Insurance, will relocate from another storefront to the renovated space by the summer. Karlene Valente has run the insurance firm in the neighborhood for 25 years. Matt Spain, co-founder and Chief Operating Officer of Wireless Store, Inc.— the company that will operate the T-Mobile store— expects that it will open for business on April 18 with nine full-time employees. “Fields Corner was an obvious choice because of the extensive revitalization happening in Fields Corner and more specifically our building, 1493 Dorchester Ave. Until now, there has not been any good real estate options, but we have found a home run at 1493,” Spain said. Ben Johnson, who co-owns the Blarney Stone, said that he and other merchants are “very excited” that Ahern and the Feeneys are renovating the building. Rosanne Foley, the interim executive director of Fields Corner Main Streets, said that the revitalization of the building will resolve one of the district’s most pressing development problems. “As the district has been improved through the storefront project it’s really become obvious which are the last remaining gaps,” said Foley. “This will really help fill one of the major gaps. 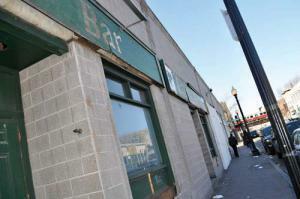 Ahern said that the building currently has one vacancy: a 1,025 square-foot storefront remains available for lease. Work on the building, he said, will be 100 percent complete by June 1.